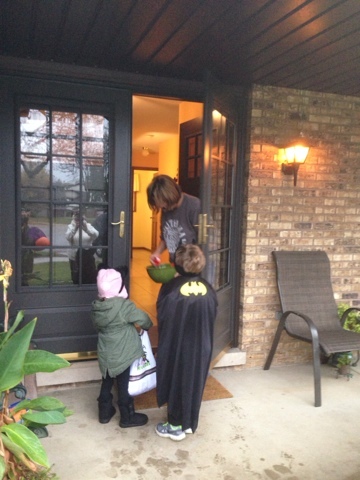 Halloween weekend started on Friday with my little man's school party. I was SO excited to be one of the volunteers and spend the afternoon with him. First though, there was a little parade around the school. The kids had SO much fun with each and every station. It is so cute to watch them enjoying themselves and acting silly with eachother. I loved being able to see Brayden in his classroom and how he interacts with his teachers and friends. He can be pretty quiet in social settings but he did break out a little and definitely enjoyed himself. When we got home that night and were laying in bed (he sleeps in our bed on Friday nights) I thanked him for letting me come to his party and told him how much fun I had being there. He told me he had so much fun too and his favorites parts were the mummy wrapping and goblin guts but the most favorite part for him was that I was there (insert Mommy melting here!) I love that he really enjoyed me being there. I know it won't always be like this so you better believe I soak in every moment like this when I get the chance! Saturday morning the hubs made us a yummy breakfast of pancakes and sausage and afterwards the kids colored while I messed around on the computer. 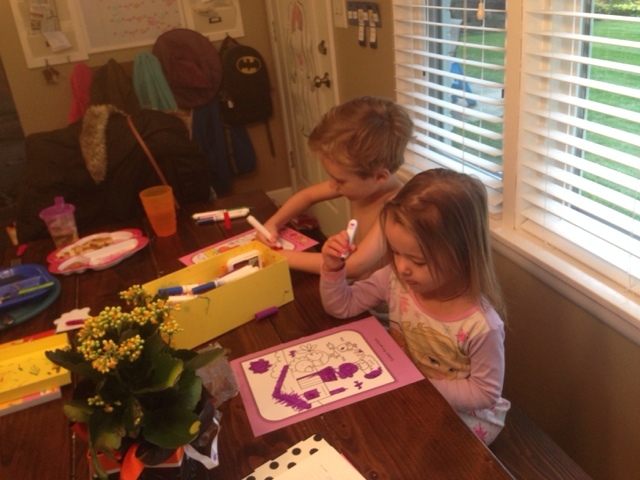 Brayden and Ella are very into coloring lately - but only with markers :) As they sat there coloring I just listened to them talk to eachother. Ella: "Brayden can you hewp me with this marker?" Brayden: "Sure, here you go" Ella: "You're being so nice to me Brayden, thank you." Brayden: "You're welcome" Ella: "I love you Brayden" Brayden: "I love you too" - Mom: Crying happy tears!! I made sure to compliment them on their nice behavior to eachother because these moments seem so few and far between! Brayden had his last soccer game of the season Saturday morning and the weather was horrible. Drizzling and not even 50 degrees but the coach said the game was still on. Grandma & Papa were suppose to come watch too and they were bringing donuts and hot chocolate for the whole team. Then, just as we were getting everyone ready to leave for the game, we get the text the game was cancelled. I was bummed because I hadn't been to a game in a few weeks but it wouldn't have been very fun sitting out there in freezing rain! We didn't get the message in time to my in laws so they made their way over to our house with 50 donut holes and a huge thing of hot chocolate. The kids happily indulged in way too many donuts. As the morning went on I started to feel really sick, body aches and my head was pounding. 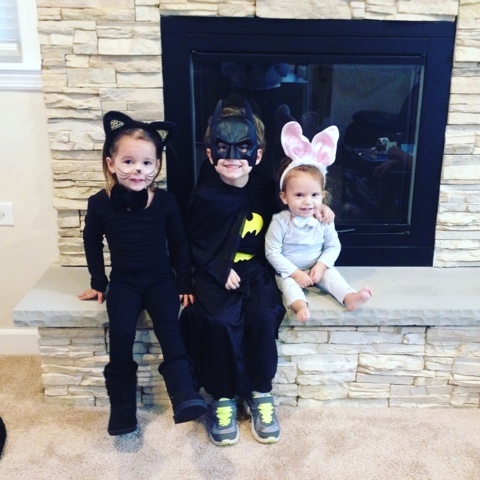 I managed to pull myself together and get the kids all ready in their costumes to head out trick or treating. Here they are before we headed out! The weather wasn't great but it wasn't that awful either. The rain had pretty much stopped and it was low 50s. 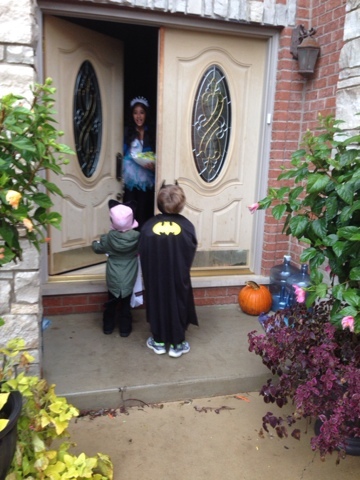 We trick or treated for about an hour then went by my in laws for pizza. 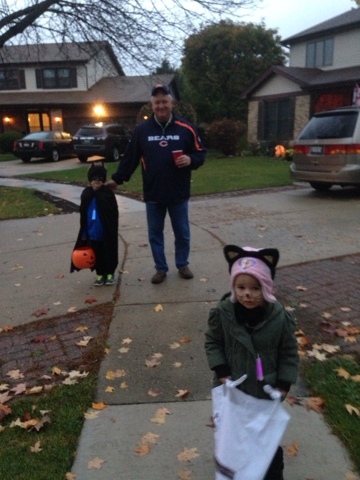 After the kids ate, my Mom, my father in law and I took Brayden and Ella around the block for a little more trick or treating. 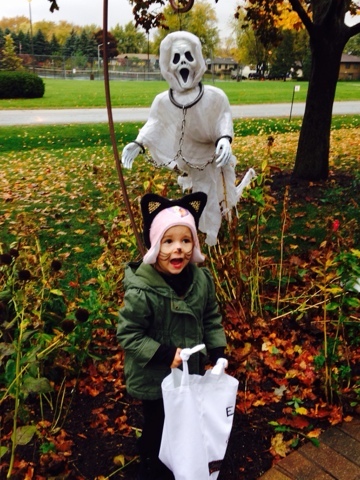 Trick or treating was so fun this year for Ella! It was really her first real experience since last year it was in the 30's and we made it to 2 houses and in that time poor girl fell and smacked her face on the sidewalk and the year before that she was so little, 13 months and not walking. So this year was her year! Brayden of course was all about it too!! They both have been counting down the days to Halloween for about a month now. Then we watched about half of Ghostbusters and put the bigger kids to bed. I was so ready to just lay down, I still felt terrible. Throughout the night I just felt myself getting sicker and sicker and when I woke up I was full blown sick! Fever, chills, body aches, sore throat, the whole shebang! I literally spent all of Sunday either on the couch or my bed. So not a great end to our weekend but Friday and Saturday were great so I can't complain! 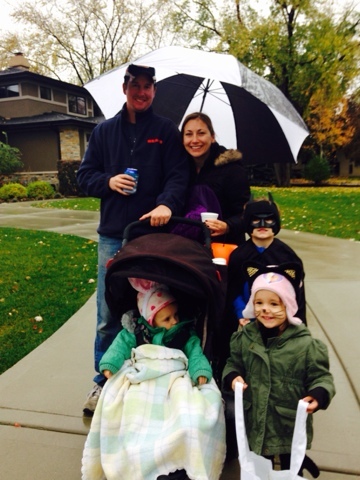 Another awesome Halloween in the books!